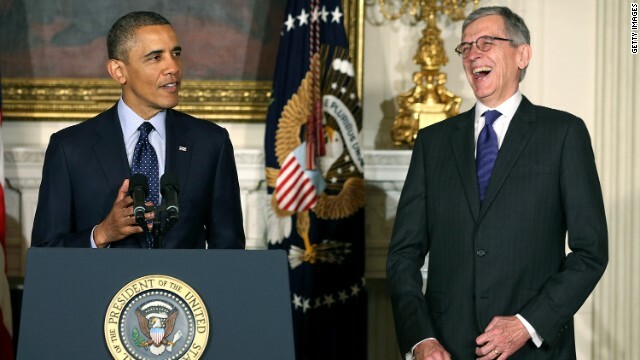 Washington (CNN) - Calling him the "Bo Jackson of telecom" for his membership in both the cable television and wireless industries' halls of fame, President Obama announced plans Wednesday to nominate Tom Wheeler to head the Federal Communications Commission. "For more than 30 years Tom's been at the forefront of some of the very dramatic changes that we've seen in the way we communicate and how we live our lives," Obama said. Roughly half of Wheeler's 30 year career has been spent as a chief lobbyist for the telecommunications industry, first as president of the National Cable Television Association from 1979 to 1984 and then as CEO of the Cellular Telecommunications & Internet Association from 1992 to 2004. But his supporters point out that while Wheeler was in charge both of these industries were seen as newcomers lobbying for increased consumer access. "The industries were different then," said Dale Hatfield, former chief of the FCC's Office of Plans and Policy and a supporter of Wheeler's nomination. "They were still emerging then and he's always been on the pro-competition side." Wheeler currently serves as managing director of Core Capital Partners, a Washington D.C.-based venture capital firm focusing on information technology companies. "I think he will probably be one of the most experienced FCC Chairmen that I can remember, because of the range and depth of his experience in the relevant industries," said Tom Lenard, president of the Tech Policy Institute. "I think the concerns that he's been a lobbyist for various industries are overblown at a minimum. I think he's going to understand what it is to have a government job and serve in the public interest but his experience is going to serve him well." As an early supporter of then-Senator Obama's campaign for president, Wheeler and his wife moved to Iowa in 2007 to work in the run-up to the state's caucuses. He also raised hundreds of thousands of dollars for the president as a bundler in both 2008 and 2012. After the 2008 election, Wheeler served as a technology advisor on the president's transition team. Kevin Werbach, who served alongside Wheeler on the president's transition and was a counsel for the FCC during the Clinton Administration, dismissed concerns that Wheeler's appointment may be a thank you for his fundraising efforts or a favor to corporate interests. "The president isn't nominating a résumé, he's nominating a person and people who have worked with Tom Wheeler and have seen him in action know that it's unfair to say he's here just because he was a lobbyist or just because he was a fundraiser," said Werbach, who's now a professor at the University of Pennsylvania Wharton School. In March, a vocal group of Democratic senators wrote a letter to the president calling for the promotion of Democratic Commissioner Jessica Rosenworcel as the FCC's first chairwoman. The effort was spearheaded by a senators who have expressed hesitance about Wheeler's close connection to many of the industry's he may be responsible for regulating. "The loudest opposition is from groups who look at his resume and see that he ran industry trade organizations and expect he'll be too industry friendly," Werbach said. "But that's looking at a piece of paper. It's a challenge for him during the confirmation process to make clear that he's not going there to be a servant for the industries he used to work for." The next FCC chair will have to deal with challenges surrounding an impending court decision on internet freedom, an exploding demand for wireless data and the ongoing transition to an all-internet protocol communications infrastructure. These changes create a desire for a "strong, principled leader at the FCC," Werbach said. In addition to his experience in telecom, Wheeler has also authored two books on Abraham Lincoln's leadership during the Civil War, a fact several of his former colleagues cited as proof that he is capable of being an effective chairman. Current FCC Chairman Julius Genachowski plans to step down in mid-May, at which point the president announced that Commissioner Mignon Clyburn will take over as acting chairwoman until Wheeler can be confirmed. Tom Wheeler is an EXCELLENT, EXCELLENT common-sense choice! Did I already say EXCELLENT? It's going to look really awkward for the Republicans to filibuster this nomination. But, they don't care how it looks. It's the end result that matters. The man WAS a lobbyist. I don't have a single problem with that, nor do I care if some of you who DO have a problem with that. Wanna know why? Because.....no matter how straight this President has played it. No matter how much he's tried to be true to his orginal words. No matter WHAT THE HELL he does y'all are going to have a problem with it. Its' been FIVE years of your incessant yapping, nitpicking, and baseless finger-pointing. We've had it with you all. So I say f'it we're moving forward with or without you all. And you all know who you all are. Congratulations Mr. Wheeler I hope you get confirmed. Does it really matter? The FCC is whatever Telecoms say it is. Does anyone believe a word that comes out of Obama's mouth? I am sure that the press would be apoplectic if a republican president nominated a CAREER LOBBYIST for a cabinet post. Obama is such a hypocrite. His presidency becomes more of a joke on a daily basis. Can't wait to see how far back he walks his "red-line" tough-guy talk on Syria. Right now Iran and North Korea are having a good laugh at him and are by no means worried about him or his red-lines. Come on haters, let's hear it... He's too old, too white, a lobbyist, oblumah's an elitist, we don't like obumma, even if he cures cancer, blah, blah. You know you want to scream and complain. The man WAS a lobbyist . A kid in a candy stor ! Anyone remember the campaign promises Obama made in 08? What was that promise about lobbyists again? Anyone? Obama, I'm very disappointed in him. He's just another politician in bed with the lobbiest!! As long as you have not lobbied for a year for a certain cause you are eligible. So Wheeler is eligible. Maybe, yes. Times have changed so maybe we will have to give up some to gain more security.......OR NO....NEVER....it's what the terrorists want and then they win. They want us to change .... THIS FORM OF GOVERNMENT is what they are fighting. They hate our freedoms. We just have to decide do we want more security and less freedoms or freedom & less security. Unfortunately, we cannot have it both ways. Welcome to the world. The rest of the world has been living with terrorism, bombings & killing of their people for years and now we are less isolated from the rest of the reality of modern times. Not exactly thrilled with all the fat-cat lobbyists and downright billionaires Obama's been nominating lately. Also: what on earth does writing books on Abraham Lincoln have to do with executive excellence? Does the Lincoln brilliance as an executive rub off on the biographer? I'm sorry, but this smells bad. Who exactly are Wheeler's alleigences with? He already took care of paying off government during his term as a lobbyist and that is why he is being rewarded with this position. Now it's his time that he can pay back all the industry titan pals. This scenario is so common that politicians don't even have to look beyond their contribution list for nominees? I mean.....come on, REALLY ? Most people know that the real terrorists are in Washington disguised as congressmen, senators, the brass in the armed services and the lobbyist groups that feed these loathsome creatures. All the elected officials care about is being re-elected the next term and will ambulance chase whatever feeding frenzy the news reports next. "We the People" only has meaning for reps from the republican and democratic parties. This is now a police state. No lobbyist in my government brash rah charlatans. Besides being a Lobbyist (I have no respect for any lobbyist of any kind) what JOBS related to the FCC has this man held? this can't be – Obama promised he would not hire lobbyists – remember?